Root Riot are plant starter cubes for cuttings and seeds for soil or hydroponics. Includes a free Clonex® Gel 15 ml packet (EPA No. 79664-1). Made from material and are fully biodegradable. 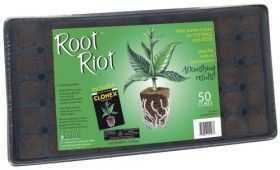 Root Riot will give you faster, more vigorous rooting. Perfect air/water capacity for healthy roots. New plants transfer easily into soil or any other media.